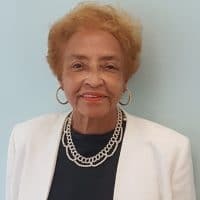 Dr. Onita Estes-Hicks served on the faculty at the State University of New York for 35 years, retiring as Distinguished Teaching Professor and chair of the English Department. A strong student advocate, she received the Chancellor’s Excellence in Teaching Award and continues to mentor former students. Dr. Estes-Hicks was a member of the first Encore Transition Program directed by Ruth Wooden at Union Theological Seminary. A cradle Catholic, at Union she pursued issues of Racial and Religious Reconciliation, addressing the themes of justice and reconciliation posed by the Jesuit/Georgetown Slave Sale of 1838 which involved her paternal ancestors Nace and Biby Butler and their twelve children. Through her family association, Descendants Ascending: the Descendants of Nace and Biby Butler, she is committed to probing questions of religious and racial reconciliation in the context of the promises of universality of the Catholic faith her family inherited from Jesuit-enslaved ancestors. Dr. Estes-Hicks has published articles and book chapters on Autobiography, African-American writers and sainthood. Presently, Dr. Estes-Hicks serves on the Advisory Board of the Lt. Joseph P. Kennedy Community Center in Harlem and is a member of the Social Justice Ministry at St. Charles Borromeo Church.